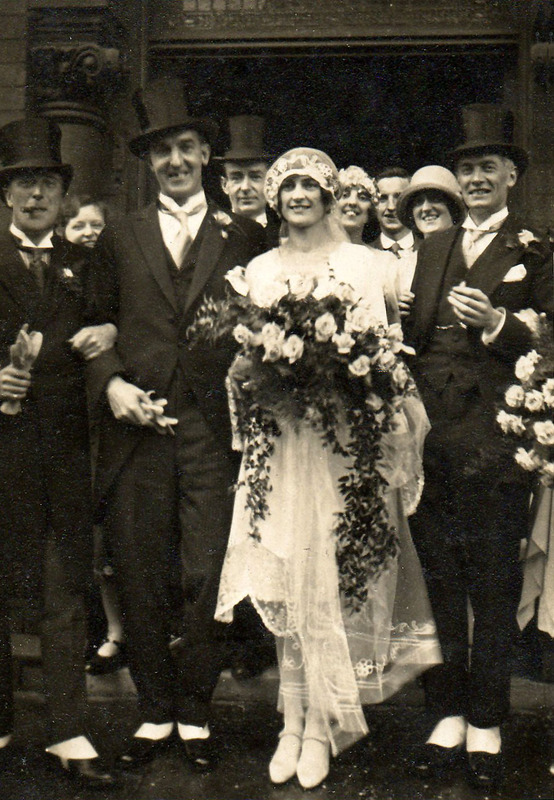 This is a lovely collection of 8 Old Wedding Photos. 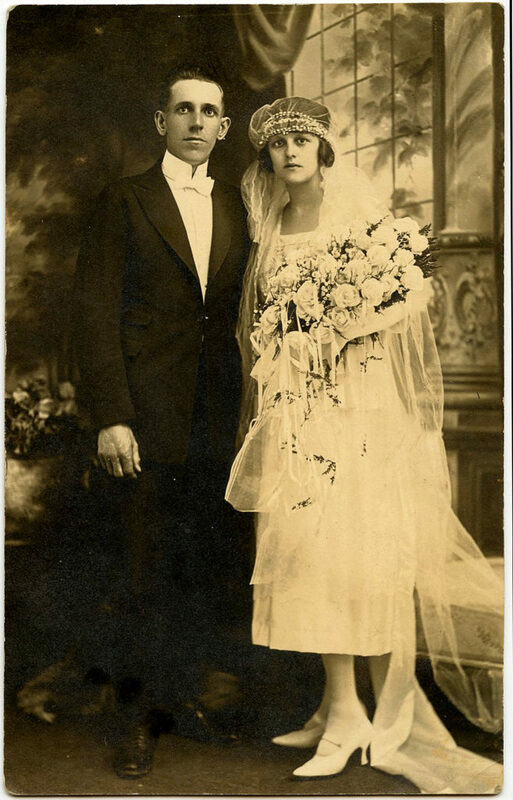 These are all black and white antique photos showing Beautiful Brides, and some Handsome Grooms, on their Big Day. Most of these were scanned from my collection and they are all high resolution images that you can download for your Craft and Design Projects. I know these Antique Photographs are very popular right now to use in Junk Journals… perhaps you could use these to make a special journal for a Bride to be! 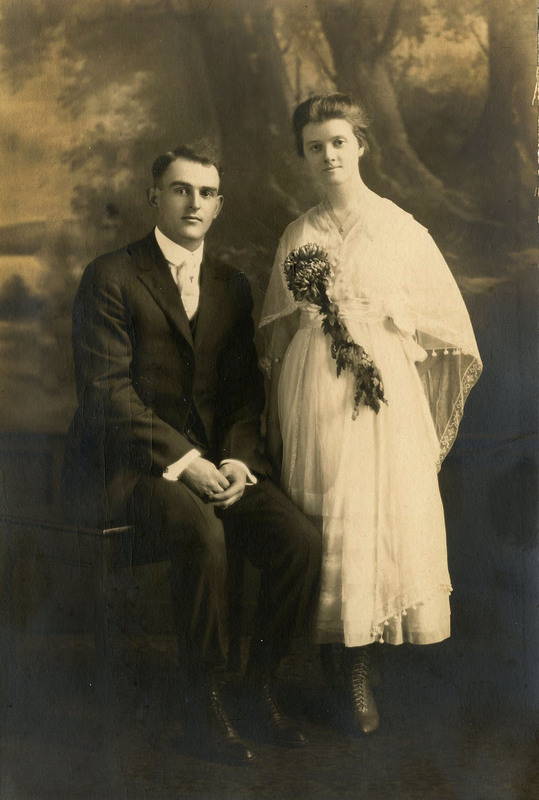 This is a fabulous old photo of a Bride and Groom! Everyone looks so jolly don’t they?!! I just love the men’s Top Hats and spats on their shoes, so fun! This one was submitted by a very kind reader named Clare quite a few years ago. Thank you Clare!! This one was scanned from a wonderful antique photo album. There were actually 3 charming Wedding Photos in the album, showing 3 different couples, all dressed in their wedding day finery. The Bride is holding quite a large bouquet of White Roses! This first one is my favorite and you will find the other 2 directly below. In this next photo, I think this couple look a bit happier than the one directly above! The Bride is holding a large Bouquet of Roses and Ferns and she has bits of Fern all tucked into the fabric in the front of her gown. This one was dated 1926 on the back of it. 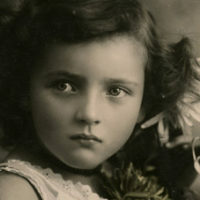 This is the third Photograph from that old family album. 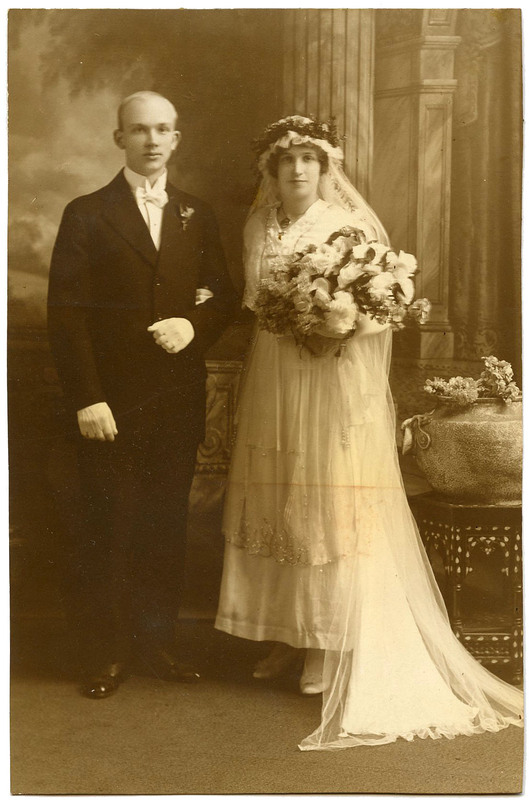 These two look quite young to me, the groom in particular has such a baby face! This one is dated 1918 on the back of it. This lovely couple have such serene expressions on their faces. the Bride is not wearing a Veil on her head, but I think it may be draped over her shoulders there. She’s got her bouquet pinned to the front of her bodice. The Groom looks very sharp in his best suit! I think I purchased this one at an Antique Mall many years ago. 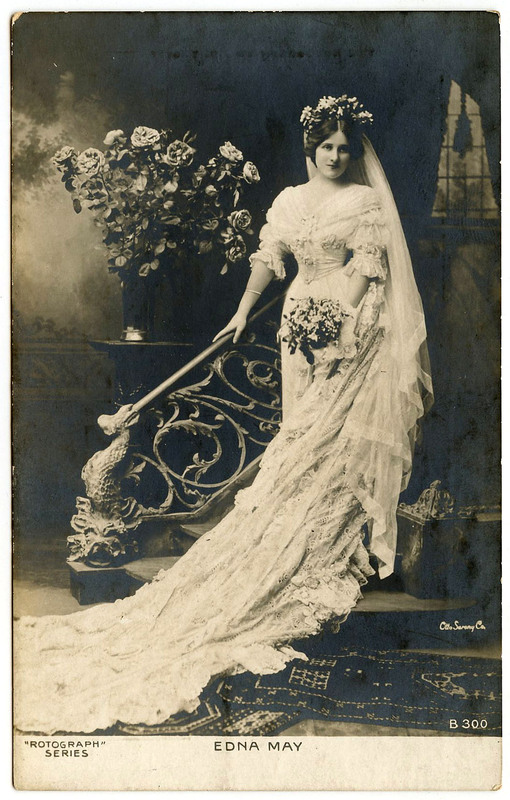 Next we have a very interesting Victorian Wedding Photo, showing a Bride in a Black Wedding Dress, with a long white veil. The veil appears to be topped with flowers or some type of greenery. She’s holding a white hanky in her hand. Perhaps she is in mourning? The scene is quite formal, with a patterned carpet and Eastlake Style Table with a Velvet tasseled table topper. I love the frame of this Photo, it was apparently taken in Cedar Falls Iowa. 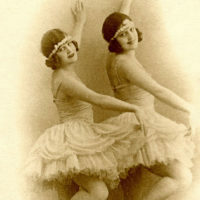 There are names written on the card … they are difficult to make out, but it looks like it says Peter Jepson and Amalie on the back. 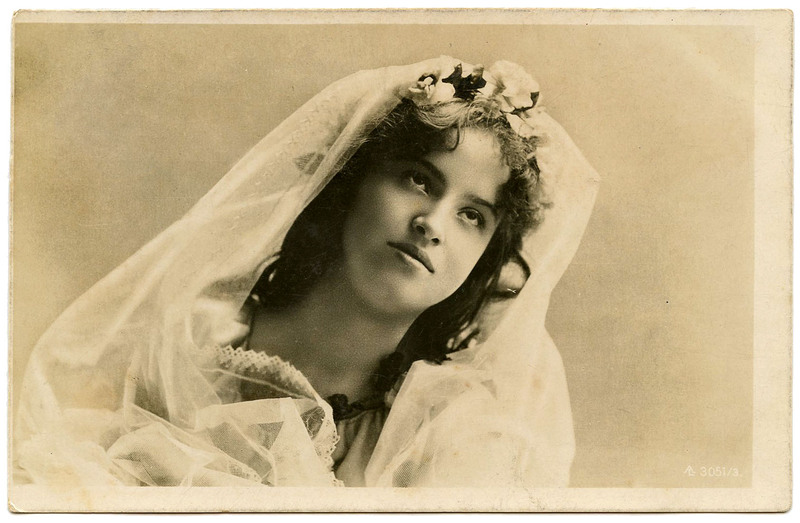 These last 2 are Real Photo Postcards of Brides. These are most likely not real brides, but instead they are Actresses posing as Brides. I thought they go nicely with this collection though. The first one is quite a beauty! Her beautiful face is framed with a soft white veil and she has flowers adorning her hair. This is a European card although I’m not sure what country it’s from, the handwriting on the back is French, but the stamp is German. I think the date on the postmark is 1906. And lastly we see Edna May, who was a beautiful American actress. Doesn’t she look stunning in this amazing Bridal gown with it’s long lace train?! Her hair is crowned with white flowers and her long veil is flowing out of the crown. She’s posing on a staircase with a highly ornate Iron Railing. I hope you enjoyed this collection of 7 Old Wedding Photos! If you like Vintage Photographs, you might also like our Vintage Cowgirl Collection HERE. I just adore this web-site!!! Brings a little spot of joy to my life every day!! such a sweet photo…thanks for sharing! I always love the variety of Pix you have. So greatful that I would like to share some of mine w/you. I have a little scrapbook that I inherited, that is full of old advertizement cards. Are you interested? Oh, you’re so sweet! If the images are from before 1923, and if you can scan them at 300 dpi, then I would love them! You can email the scans to my email addy, located on my contact page. Thanks! This will be great on my vintage style cards. What fun!! 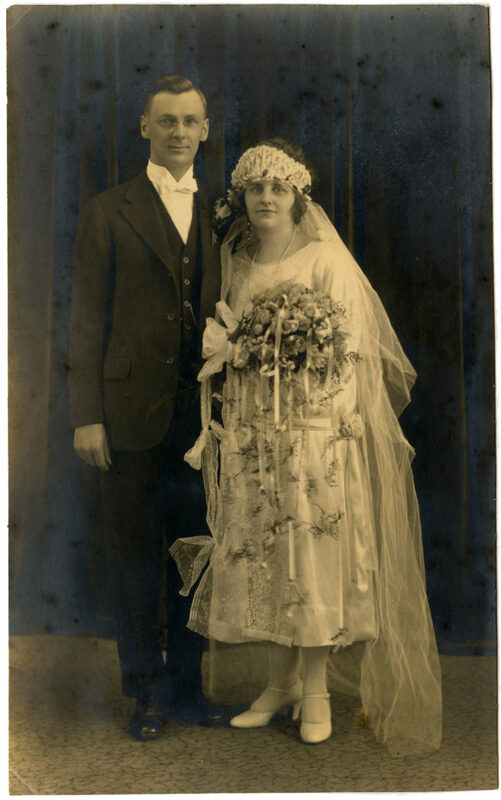 I love old wedding photos as well. It would make a good image for a card. Diana here again. I dont have a scanner, so if I get copies, could I mail them to you? I don’t think the quality would be quite high enough, going from a copy to a scan. I hope I don’t sound unappreciative, I just try to make sure my readers get good quality images so that they can use them for their projects. Thanks anyway for thinking of me Diana, I really do appreciate it!! What a sweet photo. She is a lovely bride. It’s not uncommon that older wedding dresses are in other colors than white, such as black. 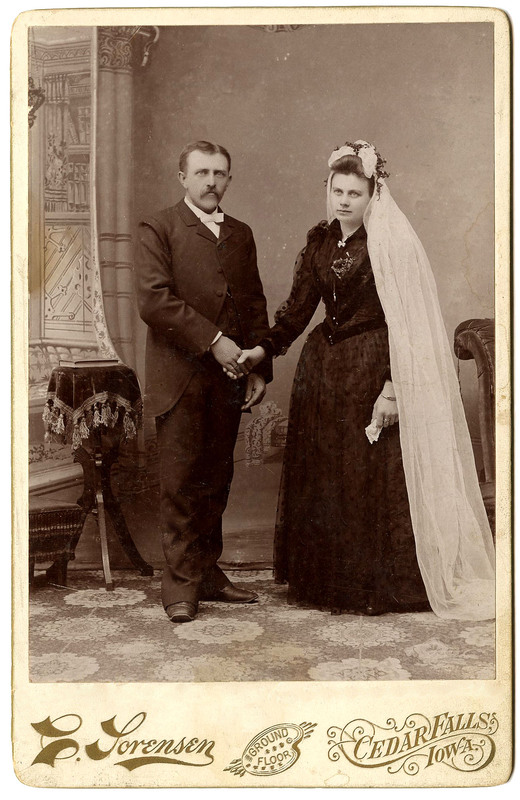 Especially in Scandinavia wedding dresses were commonly black in older days. The bride was probably not in mourning but it was most likely considered a normal color for a wedding dress in her era and place. In those days, women simply just wore their best dress on their wedding day, and that was often a black one. Apparently, white wedding dresses only slowly started to gain popularity in the 1840s after Queen Victoria married in a white dress, but it would take much longer for the lower classes to follow the new traditions – hence there are photos of such dresses. Very interesting! May I suggest a bundle for members with old pics of men, women and/or children with the backgrounds removed? That would be of great help and so versatile! I am sure you will love the Photoshop course and do great! Thanks so much for the suggestions, I will add them to the suggestions folder for sure! I would bet money that this bride is dead because of the way she’s leaning over and the wearing of black. They had stands to hold bodies upright for the photo. Oh gosh, I hope not Crystal! I have heard it was common to wear black wedding gowns before white became the norm. Wow, all of the different styles of wedding dresses! Edna May sure is stunning while she poses on that beautiful staircase. I love this one along with a few of the others. Some of the bouquets are just huge!! Big and beautiful! The one in the black — I would think that maybe it was taken while mourning. There are no flowers. Maybe a shotgun wedding? He looks like he could be her father. They don’t look too happy. LOL! But these are all really nice, very interesting! I love your ideas on all of these Irene, thanks for sharing! Each and every dress is so unique. All of the veils the brides wore are also very different from each other. And no hats. I’m surprised because hats were such a big part of wardrobes, perhaps not for weddings. The first photo with the wedding party — they are so ready to party. Good looking wedding party. Dressed to the nines. Thanks for sharing these with us!